Missing teeth can inhibit the ability to chew foods and speak clearly. Cosmetically, they impair a smile, which causes embarrassment and low self-esteem. 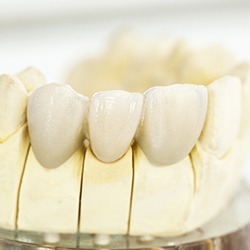 Solutions have existed for decades: bridgework, partials, and full dentures. However, these options don’t always look, feel, and function like natural teeth. Dr. DeAngelo is highly trained in dental implant restoration, which means he can offer you a tooth replacement solution that Mother Nature would commend. Call our Homer Glen dentist office today to schedule your appointment. We’ve all heard the phrase, “Jack of all trades,” and nowhere in dentistry does it apply more than in the art and science of dental implantology. Dr. Alan R. DeAngelo partners with an oral-maxillofacial surgeon to restore his implant patients with state of the art treatment that meets or exceeds the highest standard of care. Having restored dental implants for over 30 years, Dr. DeAngelo has worked with numerous dental specialists who place dental implants and has chosen who he feels is the best in their field to partner with. In the medical profession, we all know that your knee surgeon would not do open heart procedures, and vice versa, it should be the same in dentistry. You want the most talented doctors in their field of expertise working to provide you the best results. Dental implants are so much more than just screwing something into your bone. It takes proper planning, bone grafting if proper bone support is not present, and precise placement. After all, you can’t build a stable house on a weak foundation. That’s why proper bone support is so important! With my 28 years of dental implant restoration experience, and a surgeon who has placed almost 18,000 implants and teaches implant placement and bone grafting internationally, to other surgeons, you get the best of both worlds for your dental implant experience. 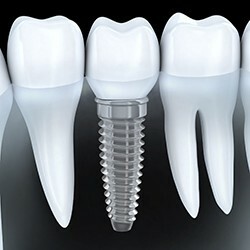 Dental implants are small, titanium fixtures that are placed directly in the socket of a missing tooth. An implant will fuse to the jaw bone and act as a tooth root, providing stability for single crowns, bridges, or overdentures. Dr. DeAngelo has restored dental implants in Homer Glen since 1986 and works with area oral surgeons for precise implant placement. If you are replacing a single tooth with a dental implant, Dr. DeAngelo will restore it using something called an implant-retained crown. 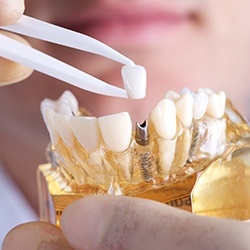 This will consist of an all-porcelain dental crown designed to fit over a metal connector that will attach it securely to your implant post. If you have multiple missing teeth in a row, he can place two of these crowns on either side of the gap in your smile and bond them to prosthetic teeth to fill in the gap, creating a strong and reliable implant-retained bridge. 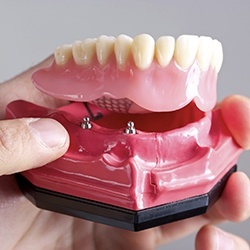 Unlike the All–on- 4 screw retained prosthetics you will read about below, Overdentures that “SNAP” into place offers the convenience of having the ability to be cleaned at home, even after every meal, which leaves you with fresher breath. The attachments used are very secure and can be adjusted for everyone’s different needs. The cleanability of the prosthetics is a great advantage over the ALL-on-4. If something gets caught beneath them, you can do-it-yourself without the need of a dental professional, and remove the offending item. This treatment allows a patient to have dental implants placed and restored with a full denture all in one day. In other words, a patient could wake up that morning with a row of missing teeth and go to bed with a complete smile. 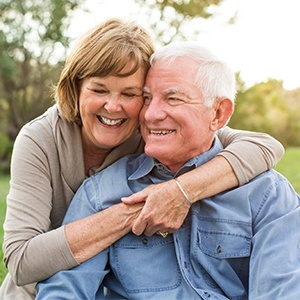 This treatment uses slightly longer dental implant posts to create maximum stability for the prosthetic, and this also makes it viable for patients who normally wouldn’t be eligible for implant dentistry. 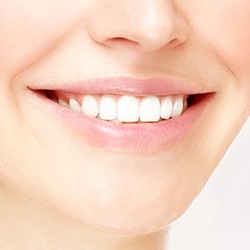 Would you believe that one of the biggest advantages of using this technique to restore your smile isn’t cosmetic? When a tooth is lost, the surrounding bone and gum tissue will begin to deteriorate with nothing to support. 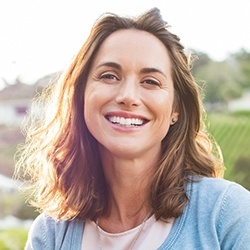 By placing and restoring a permanent dental implant (or implants) to mend your row of teeth, the jaw bone and gums are revitalized with purpose once again. Over time, bone density can improve and the gums are renewed. Meanwhile, your smile will look realistically beautiful and will function like an unharmed bite! Dental Implants Have Many Advantages! No natural, healthy tooth structure is removed (as with bridge placement). No adhesives or clasps are required. Overdentures will not slip or move around while you speak. No special care routine necessary – treat a dental implant like a natural tooth by brushing, flossing, and attending regular dental checkups and hygiene cleanings. A dental implant will look, feel, and function like a natural tooth. Feel free to ask as many dental implant-related questions as you want at any point in your care at our Homer Glen office. Dr. DeAngelo is happy to help you fully understand your smile solution, and encourages all of his patients to stay informed about their care.